Evergreen to growth on the coast of the warm season in rhaphiolepis umbellata genus of the rose family is a shrub. Country of origin in Japan, has been frequently used since the leaves are especially good in a strong 耐潮 of cold resistance for chunky to implantation of the separation zone and sidewalk of the road. 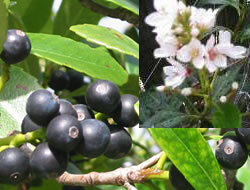 In Tokashiki Island, Forest Park and Teruyama promenade, can be seen in along the forest road, and give the fruit of black-purple in autumn with a small white flower from an early March. Bark have also been used as a dye, it has become a material, such as dyeing course in Tokashiki. Is also known as the dye of the is spinning weaving Amami Oshima of specialty products.